The shape of this vase was popular during the Ming and Qing dynasties and possibly modeled after European bottle of the period. The cracked ice background decoration draws its inspiration from a ceramic technique initiated during the Kangxi era. The four sides of the vase depict plants, rocks, vases, bronze vessels, books, scrolls, a "qin," a sword and a fan in the shape of a banana leaf -- objects which signify the comfortable everyday life of the urban scholar-official. This type of composition, with objects floating freely, is also seen in eighteenth century ceramics, lacquerware and furniture decoration. It was an icon of eighteenth century China and may well be a reflection of the prevailing materialistic urban culture. The use of cloisonné for scholarly objects at this time also indicates a change of attitude brought about by the imperial patronage. Soon after its introduction to China, cloisonné was criticized by an early Ming Confucian scholar. Cao Zhao opposed the rich decoration of cloisonné, which presented a striking contrast to the monochrome ink paintings favored by the literati from the Yuan time onwards. 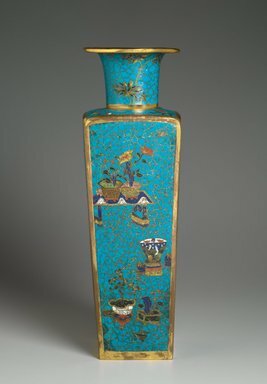 Undoubtedly, the cloisonné was very popular with the ladies of the imperial court, and their patronage and taste may have influenced production. In deep cobalt blue, red, yellow, dark green, light green, brown, and white on a very deep turquoise background.